A Russian Soyuz rocket stands atop its launchpad at Baikonur Cosmodrome in Kazakhstan ahead of the Dec. 15, 2015 launch of the Expedition 46 crew to the International Space Station. Three new crewmembers will launch to the International Space Station aboard a Soyuz spacecraft early Tuesday (Dec. 15), and you can watch the liftoff live online. NASA astronaut Tim Kopra and cosmonaut Yuri Malenchenko, both spaceflight veterans, will be joined by first-time spaceflier Tim Peake — who will be the first British astronaut to visit the International Space Station. Malenchenko has flown six previous missions and will command the Russian Soyuz craft during the flight, which is scheduled to launch from the Baikonur Cosmodrome in Kazakhstan at 6:03 a.m. EST (1103 GMT). 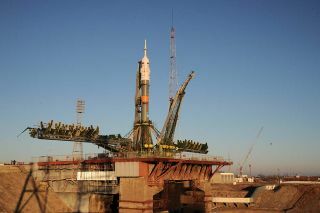 You can watch the launch live on Space.com, starting at 5 a.m. EST (1000 GMT), courtesy of NASA TV. After the craft's 6-hour journey, you can tune in to see it rendezvous and dock with the Russian segment of the space station at 12:24 p.m. EST (1724 GMT) and watch the hatch open between the craft and the space station at 2:25 p.m. EST (1925 GMT). At that point, the arriving crew will be greeted by the space station's current inhabitants: NASA astronaut Scott Kelly and cosmonauts Mikhail Kornienko and Sergey Volkov. Kelly and Kornienko are nearing the end of their year-long space mission, and Volkov has been on the station since early September. Kelly is the current space station commander, but Kopra will take his place once Kelly, Kornienko and Volkov leave the station in March. The new mission is a particularly exciting one for the U.K., which will see the first British visitor to the International Space Station. In 1991, British chemist Helen Sharman spent a week on the Russian space station Mir. On Twitter, followers have been wishing Peake luck with the hashtag #GoodLuckTim. Once aboard, the three crewmembers will quickly become involved with the many research projects planned for the Expedition 46 and 47 missions. Besides continuing to study the effects space has on the human body, the astronauts will study protein structures, investigate flame combustion and how different materials melt, track microbes aboard the space station and take detailed data about the Earth's atmosphere and ionosphere. They will also test out an inflatable capsule similar to one that could be used for future space habitats in Earth orbit, on the moon or on Mars. The crew will be joined by three more members in March, after the three old crewmembers depart, and are scheduled to return to Earth in June.